Heat oven to 350°F. In medium bowl, break up cookie dough. Mix in crushed graham crackers with wooden spoon until blended. Shape dough into 24 (1-inch) balls. On ungreased cookie sheet, place balls 2 inches apart. Bake 9 to 11 minutes or until golden brown. Cool 2 minutes; remove from cookie sheet to cooling rack. Cool completely. Set oven control to broil. Cut marshmallows in half crosswise. Return cookies to ungreased cookie sheet. 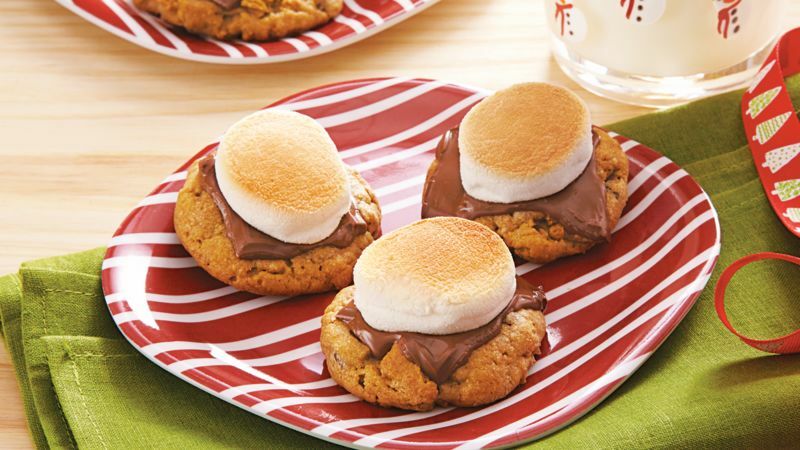 Top each cookie with 2 pieces milk chocolate candy and 1 marshmallow half, cut side down. Broil with tops 4 inches from heat 30 seconds to 1 minute or until marshmallows are toasted. Serve warm or cool. Store in single layer tightly covered at room temperature. Watch closely when broiling the marshmallow-topped cookies; rotate the cookie sheet if necessary for even toasting.